The Huskimo Cableknit Dog Jumper is a great jumper for dogs of every size, age, and breed. Designed to, stretch to fit, it hugs all body types perfectly ensuring an ideal indoor jumper on those cold nights. A must have this winter! These Huskimo Cableknit Dog Jumper are a high-quality Australian garment that will look great on most dogs. 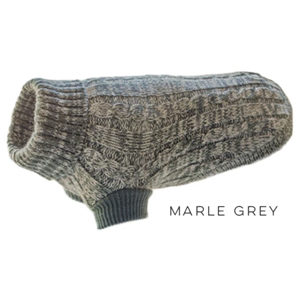 Lovely soft, comfy knit with short knitted legs & the knit fits snugly around the dog’s body. 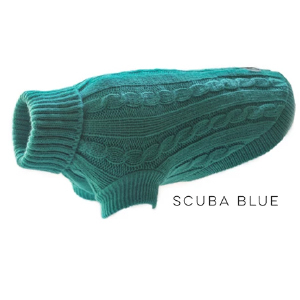 These unique jumpers consist of a turtle neck design – where the collar may be unfolded up the neck to keep your pup even warmer. The jumper is a pull-over design with cuffed leg holes for the front legs and open back end, making it easy to get it on and off. An ideal extra layer of warmth on those chilly winter days and nights for any pup! Measure from the base of neck to base of the tail.